Summer can wreak some serious damage on hair, between the pool, sun and all of the elements that you come in contact with being outdoors. There are many ways to protect your hair such as wearing a hat and trying to stay out of chlorine, but sometimes damage is inevitable. It seems like no matter how great I am feeling about my hair in April, come July I am watching it break off as I brush it no matter what I do to try and keep it healthy. I have been using Dove's Intensive Repair Daily Treatment Conditioner now for about two weeks and can really feel a difference in my hair! Many people use to only trust salon brands of shampoo and conditioner; however, many companies have proved that you can get a quality product from your drugstore. I definitely think that this is one of them. Dove Intensive Conditioner has a dual-action formula that contains patented micro moisture serum to deeply penetrate the hair and fiber actives that seal damaged cuticles and repair hair. I have especially damaged hair due to my bi-monthly tendency to dye my hair either white-blond or almost black, so I need something that is thick and nourishing for my hair - especially on the days that I am straightening it since I blow it out first and then use a flat iron. I have been using my normal shampoo and then putting the Dove Intensive Repair Daily Treatment Conditioner on and leaving it on while I shave (for about 2 minutes). 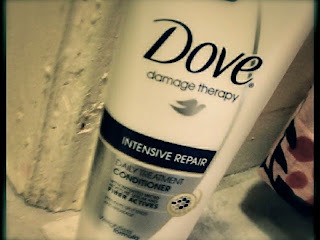 My hair immediately feels so much softer when I rinse this product out, not to mention the fact that it smells amazing! Dove products are available online at many retailers, as well as in drugstores nationwide. Interested in a Dove coupon and the chance to be entered to win a $1,000 Spafinder gift card? Follow the links below for more information!